5 Minute Coffee Cake in a Mug. You can make just about any cake in a mug, but for my first “cake in a mug” recipe I felt that coffee cake seemed fitting. This is an easy healthy version of coffee cake. Cooking cake in a mug not only takes a just few minutes, but it tastes perfectly moist and fluffy.I was extremely pleased with the end presentation and taste of the cake! Mix Butter and stevia in mug until fluffy. Next, stir in egg white, greek yogurt, and vanilla. Lastly, add your whole wheat flour and baking powder. Mix thoroughly. In a separate bowl or cup mix your topping ingredients ( flour, stevia, brown sugar, and cinnamon) Press together with your fingers or a fork, creating a crumble. 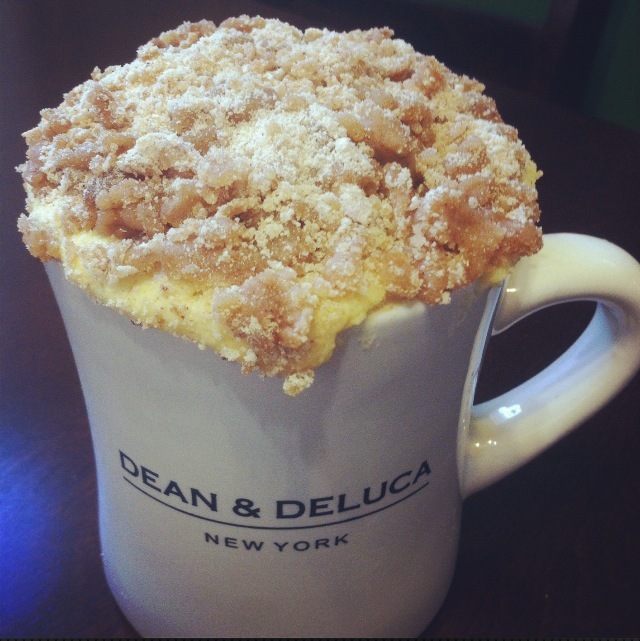 Add your crumb topping to the top of your mug. Microwave for one minute, then and add ten second intervals to complete to your satisfaction.